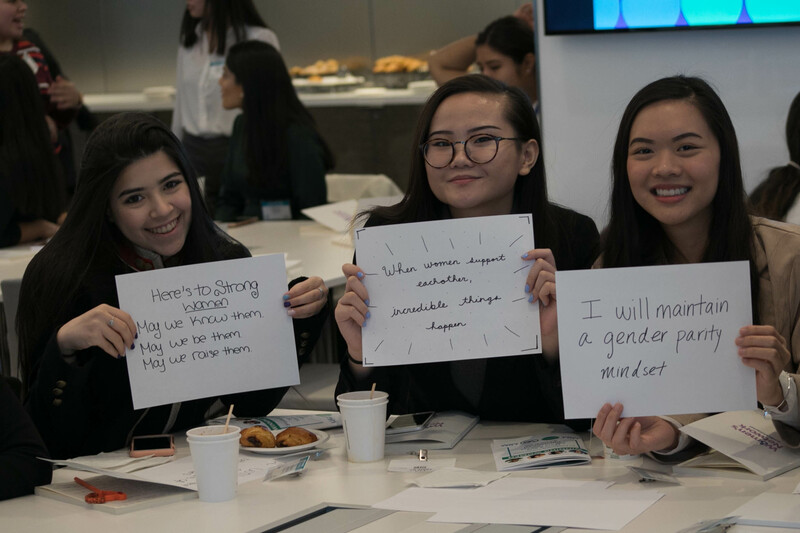 On Thursday, March 8th forty-one high school student executives gathered together for the Winning Women Leadership Conference. 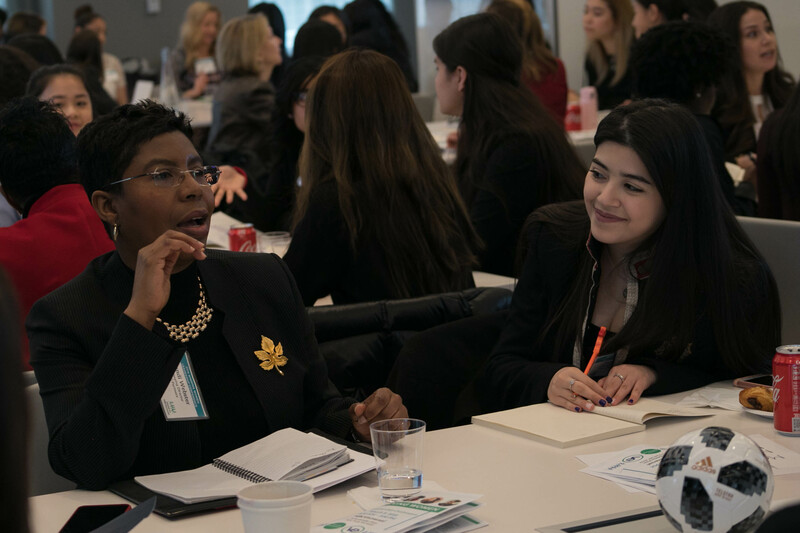 Winning Women is VE’s Female Leadership Conference Series designed to support and prepare high-potential VE female students for future success. This conference, the third in a series hosted by NBCUniversal, provides students with leadership and early career development training. This year the event took place on the same day as International Women’s Day, allowing us to celebrate two unique events in conjunction with one another. The morning session was led by NBCUniversal mentors, Meaghan Quindlen, Erin O’Leary, Deirdre Hussey, and Dale Dykes. During the session, students received leadership coaching on communication skills, personal branding, professional presence and emotional intelligence. After the leadership coaching, the student executives listened to a panel of NBCUniversal employees who had a range of college and work experience. The panel discussed their methods of navigating college and shared their insights on seeking internship and employment opportunities after college. In between these sessions, students created signs that reflected their personal thoughts about women. The young women used the signs as a vehicle to create powerful and meaningful phrases to express their feelings about themselves and the women in their lives. The afternoon session consisted of female business leaders from various industries and career backgrounds who engaged in themed break-out activities with the students. This session was intended to put the morning leadership coaching session into action. 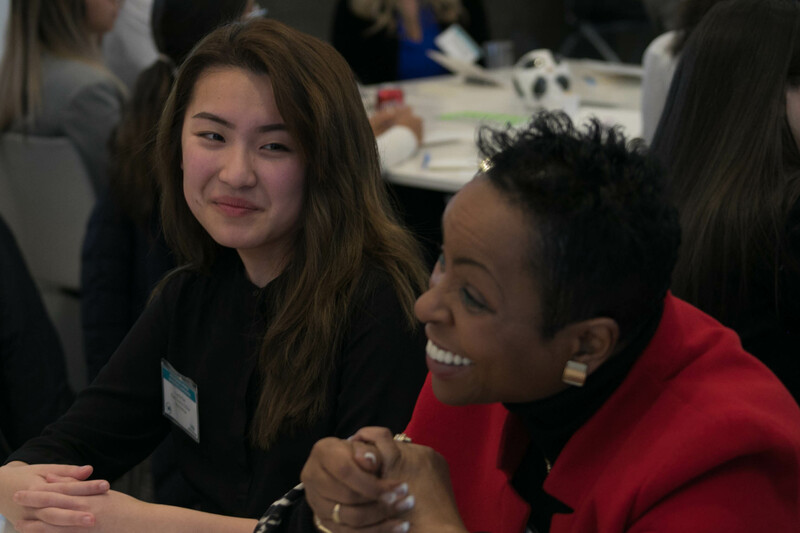 Mentors and students were paired up to engage in various activities, including developing a group logo and theme song, discussing workplace scenarios, and finding solutions to case studies. They discussed appropriate and professional workplace behaviors, methods of following up, and ways to become more engaged in a professional environment. A theme that resonated throughout the day was the theme of “building confidence.” Mentors stressed the importance of believing in themselves and transferring that confidence to empower their peers. Taking that advice into consideration, several confident young women stood up in front of a crowd to entice them with their business pitch, discuss the impact of the VE program on them, and share moments in which they were able to conquer their fears. These presentations demonstrated the students’ growth throughout the course of the day. Through the series of morning and afternoon sessions, we know that the wisdom and expertise of these real world “Winning Women” will inspire and empower our female students in the classroom and beyond. During the closing remarks, each student shared their takeaway from the event and how it shaped their perspective on their future careers.